Pope Francis leaves after celebrating Mass marking the feast of Pentecost in St Peter’s Basilica at the Vatican on 20 May. 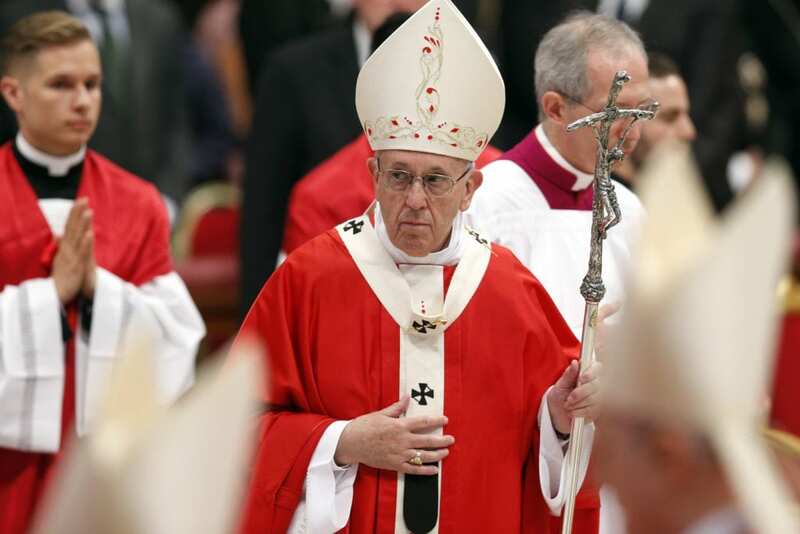 The Pope at his “Regina Coeli” announced that he will create 14 new cardinals on 29 June. Photo: Paul Haring/CNS. Christians should begin each day invoking the Holy Spirit and praying that the Spirit will lead them and the Church closer to God and closer to any person in need, Pope Francis said on Pentecost. Celebrating Mass on 20 May in St Peter’s Basilica, the Pope said the Bible – especially the Acts of the Apostles – makes it clear that the Holy Spirit brings a real power to change to individuals and the church. “The Spirit frees hearts chained by fear,” the Pope said in his homily. “To those content with half measures he inspires whole-hearted generosity. He opens hearts that are closed. “He impels the comfortable to go out and serve,” the Pope continued. Cardinals Santos Abril Castello, Angelo Comastri, Peter Turkson and Franc Rode pray the Lord’s Prayer in St Peter’s Basilica on 20 May. Photo: Paul Haring/CNS. Pope Francis said people often vow to change, but lack the power to do so. The power of the Holy Spirit is different, he stated. The change occurs because the Holy Spirit brings God’s forgiveness, he said. “From guilty he makes us righteous and thus changes everything. “By the working of the Holy Spirit, joy is reborn and peace blossoms in our hearts,” the Pope said, before offering a special prayer for peace in the Holy Land, especially in Gaza where violent protests led to the deaths of 60 people in early May. The Holy Father prayed that the Holy Spirit would “blow upon our world the soothing warmth of peace and the refreshing cool of hope”. St Mary’s Cathedral Choir from Sydney sings before Pope Francis’ celebration of Mass marking the feast of Pentecost. Photo: Paul Haring/CNS. In a week that included Pope Francis’ three-day meeting with the bishops of Chile to discuss the sexual abuse scandal, a meeting that ended with all the bishops offering the Pope their resignations, the Pope said, “frequently, even in the bleakest of times, the Spirit has raised up the most outstanding holiness. Because he is the soul of the church, who constantly enlivens her with renewed hope, fills her with joy, makes her fruitful, and causes new life to blossom”. Pope Francis prayed that the Holy Spirit would “blow upon us, blow into our hearts and make us breathe forth the tenderness of the Father. Blow upon the church and impel her to the ends of the earth, so that, brought by you, she may bring nothing other than you”. After the Mass, Pope Francis went to the window of his studio overlooking St Peter’s Square to lead the recitation of the “Regina Coeli” prayer and to announce his decision to create 14 new cardinals from 11 nations on 29 June. But first he prayed for Mary’s intercession that the church would experience “a renewed Pentecost, a renewed youthfulness that gives us the joy of living and witnessing to the Gospel and a fervent longing to be saints for God’s greater glory”.